Marown held the opening tournament of the season for the third successive year, with the floodlight competition sponsored by Ardern & Druggan Limited attracting a strong entry of 80. The competition was played over four qualifying nights, with four qualifiers from each evening. The competition commenced on Sunday evening with home greener Colin Kelly doing enough to qualify for Thursday’s finals night ending the challenge of Rob Monk (Onchan), Nathan Hamilton (Castletown) performed well to defeat Matthew Keggen (Marown), with Jimmy Samson (Douglas) and David Proctor (Peel) the other qualifiers. Monday evening’s action had the first lady qualifier for finals night with Clare Cooper (Noble’s) winning three games to go through. Marown captain Paul Dunn took his place, Phil Kerruish (Onchan) defeated home greener Dean Kipling, with Reg Temporaza (Noble’s) taking the last spot of the night. 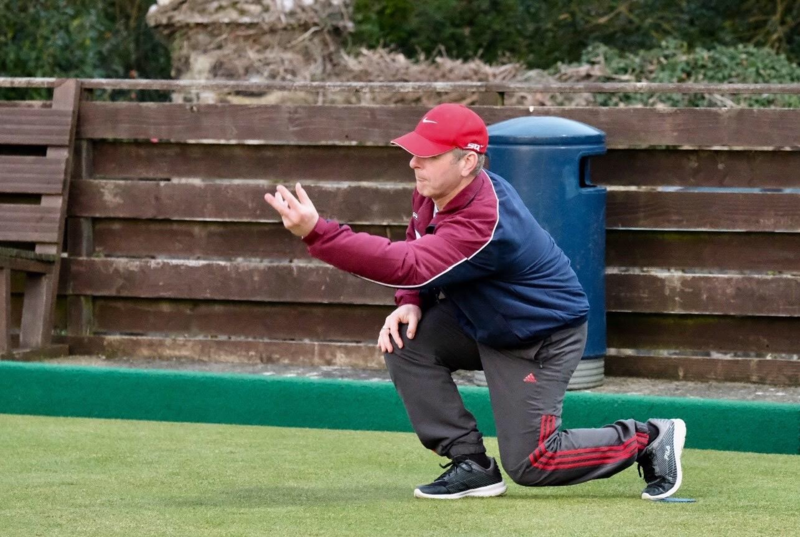 Tuesday evening saw Steve Parker (Onchan) win three games to qualify, seeing off last year’s winner David Bradford (South Ramsey) along the way, with new Onchan team mate Frank Watson also making the cut. Home greeners John Gelling and Luke Hyland performed well to take the last two spots to qualify for finals night. The final qualifying session on Wednesday was a fine evening heavily dominated by South Ramsey players, with Alan Moore seeing off Paul Kelly, Jenny Moore disposing of Dave ‘Barney’ Kelly, whilst James Teare defeated Neil Withers along the way to qualify. Home greener Celia Joughin took the last qualifying spot and was the third lady to reach finals night, just edging out another South Ramsey player Paul Routledge. Thursday evening was finals night with the draw taking place live on the night, with the last 16 being played down to the winner. There was a good turnout to watch the conclusion of the competition. Losing out at the last 16 stage were the Onchan trio of Phil Kerruish, Steve Parker and Frank Watson. Paul Dunn (Marown), Jimmy Sansom (Douglas), Reg Temporaza, David Proctor (Peel) and Nathan Hamilton (Castletown) also lost out. In the quarter finals Colin Kelly gave no mercy to team mate John Gelling winning 21-5, James Teare won 21-13 against Celia Joughin. In the other half of the draw Alan Moore won 21-12 against Clare Cooper, whilst Jenny Moore would have a been a huge favourite to go through, however Luke Hyland had other ideas taking a good 21-16 win. In the first semi final Colin Kelly won comfortably 21-11 against James Teare to reach the final, whilst club mate Luke Hyland carried on his good form seeing off Alan Moore with a 21-14 win. The final was eagerly anticipated with neither player being able to get away from the other throughout the entire game, with Kelly playing some good weighted shots to stay in the game. Hyland did manage to go ahead 17-15 before Kelly’s experience pulled him through to take a hard earned 21-17 win to secure the title and £125 first prize. The presentation was made by Neil Withers and Philip Kelly, with various spot prizes being awarded. Best junior went to Harry Barton, furthest lady went to Jenny Moore and Celia Joughin was the furthest Over 60’s player. Prizes were paid out to the last 16. Thanks were also given to the sponsor Ardern & Druggan for supporting the competition, along with the Marown ladies for the excellent refreshments throughout the week. Congratulations must go to Marown on a well run competition, which has is now a regular fixture in the bowling calendar to start the season.